One of the big issues in the U.S. pension crisis is the fact that many funds are estimating their returns based on unrealistically high assumptions. The American Legislative Exchange Council (ALEC) made a point of emphasizing that its $5.96 trillion estimate for unfunded liabilities was made “using more realistic investment return assumptions” and a “proper, risk-free discount rate.” This is probably why ALEC’s rankings on unfunded pension liabilities differs significantly from others, such as this one from Bloomberg. As a result, the estimate is much worse than the already-large official amounts reported in state financial documents. 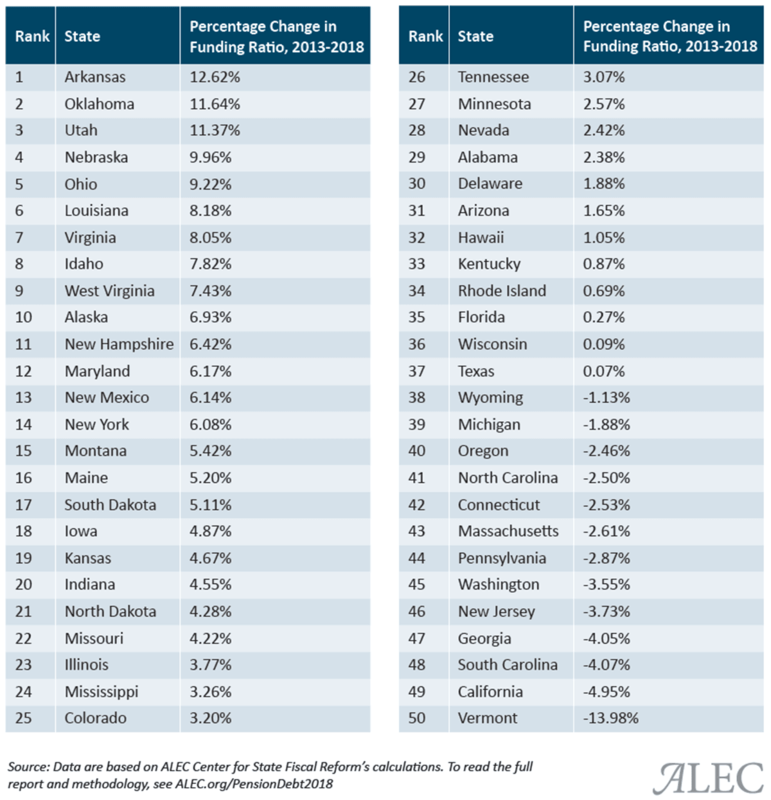 According to ALEC, the average state pension is now funded at only 35%, which means unfunded liabilities have risen to $18,300 for every resident of the U.S. Given that raising taxes is generally the go-to method to increase required contributions, this number makes it clear that state governments just can't raise taxes enough to make up for their decades-long poor management. Illinois, especially Cook County, demonstrates what happens when officials raise taxes so much that people can't afford to live there anymore. ALEC blames state governments directly for this major shortfall, explaining that most state governments are not making their annually required contributions. ARCs include the annual amount needed to cover the "normal cost of future pension obligations accrued in the present, along with amortization of prior unfunded liabilities," the organization explained. The organization even said that some states are even skipping payments entirely. 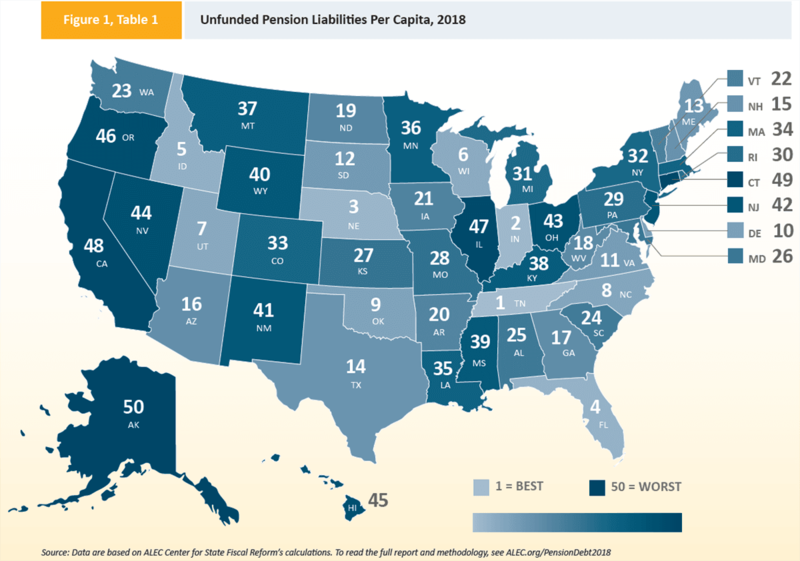 For example, a 2017 report found that just 32 states made pension contributions that were enough to cover the accrued unfunded liabilities in fiscal 2015. ALEC also notes that state workers and pensioners aren't the only ones affected by the pension crisis. Taxpayers are ultimately footing the bill for government employees' salaries and pensions, and even non-tax-paying residents are affected when pension costs capture funds that would otherwise go toward essential city services. For example, I would point out that some Chicago-area suburbs such as Harvey were forced to lay off police officers and/or firefighters when a court ruled that they must pay pension benefits even though they couldn't afford to do so. 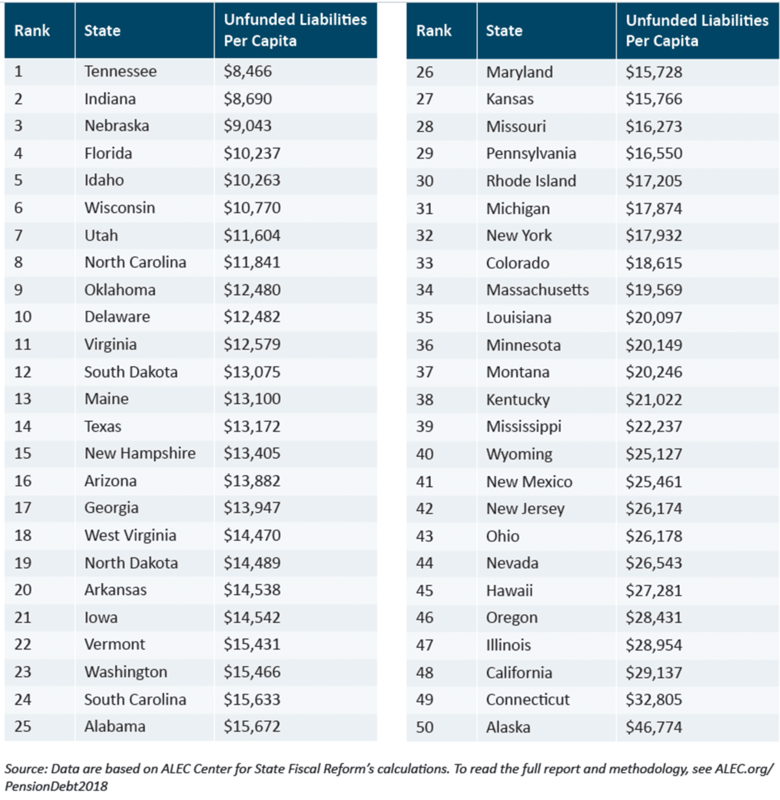 According to ALEC, the states with the least unfunded liabilities per capita are Tennessee, Indiana, Nebraska, Florida and Idaho. The five worst states are Oregon, Illinois, California, Connecticut and Alaska. ALEC also looked at states' ability to pay their unfunded pension liabilities based on gross state product. Some of the states are in the same or similar positions to their per capita ranking, although a few changed their positions dramatically. For example, Florida had the fourth-lowest per capita unfunded liabilities, but it ranked tenth in ability to pay those liabilities. The organization also looked at which states have made the most progress in fixing their troubled pension systems. Nebraska has made significant progress because not only is it among the top five in per capita unfunded liabilities, but it's also in the top five most improved. On the other hand, Indiana is closer to the middle of the pack in improvements, but the state is already in second place on a per-capita basis.